There are different reasons for using mulch in your garden, so it’s important to choose the best mulch for your purposes. And there are so many different mulches available with different appearances, prices and characteristics. • Reduces moisture loss from the soil surface, thus aiding plant growth, and reducing the need to water. It also lessens the chance of the soil surface drying out and cracking. • If used correctly it suppresses weed growth, reducing competition for water and nutrients, and decreases the amount of ‘weeding time’ the gardener has to put into maintenance. • Many types of mulch add nutrients to the soil when broken down, and improve soil structure. • Mulching also reduces run-off and soil movement from garden beds. • In winter it can help keep soil warmer so that plants grow a little more vigorously. A trial conducted by Yates a number of years ago explored the effects of particle size and highlighted a couple of important differences between chunky and fine mulches. Twenty mulches with different particle sizes were tested for two properties – their ability to reduce evaporation from the soil, and their ability to ‘soak up’ water rather than allow it to travel through to the soil. Chunky – 100% of particles did not fit through a 5mm screen. Mostly Chunky – 65% of particles were too big to fit though a 5mm screen. Chunky-fine Combination – a mix of half chunky and half fine particles (able to fit through a 2mm screen). Mostly Fine – 65% of particles were able to fit through a 2mm screen. To test this, a layer of each mulch was added to soil to a depth of 25mm. Both soil and mulch were irrigated and the relative evaporation rate was measured over the next 13 days. Bare soil was rated at 100, so any number smaller than 100 meant that the mulch was reducing the amount of evaporation. A number larger than 100 meant that evaporation through mulch was even greater than that for bare soil. The tendency for mulch to soak up water rather than allow it to travel through to the soil and plant roots was tested by pouring 500ml of water onto each of the mulches (in pots). The pots were weighed before and after the water was applied. A lower number suggests the mulch has a lower tendency to absorb the water. In other words, the lower the number the greater the amount of water that passes through the mulch and is available to plants. The chart below shows that chunky mulch was the best for reducing evaporation rate, and for allowing water to travel through. The blend of mostly chunky also rated well, but had a tendency to soak up twice the amount of water as the chunky blend. Mostly fine mulch did not perform well. It did the poorest job of reducing evaporation and, worst of all, it actually robbed the soil of moisture. This is because water moves from the soil into fine mulch by capillary action, so that the water loss can be higher than from bare soil. The fine mulches also soaked up over four times more water than chunky mulches. This means that only water from heavy rain or irrigation will actually reach the soil under a thick layer of fine mulch. Don’t apply a thick layer of fine mulch, as it will hold a lot of water that plant roots won’t ever benefit from. 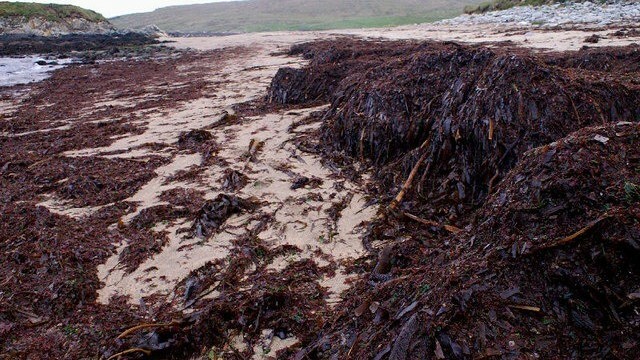 If such mulches stay very wet for a long time, they can rot and introduce disease. They also reduce air flow. The chunkier the mulch, the thicker it can be applied. Chunky mulches can be used up to 60 – 75 mm in depth without concern for blocking rain and irrigation. If using mulch with fine particles that are 2mm or smaller, mix it with chunkier mulch with a particle size greater than 5mm. Organic mulches add nutrients to the soil, but the rate and extent of addition varies according to their composition and particle size. 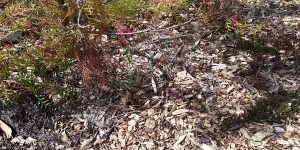 A by-product of the timber industry, these are usually readily available and, because of their usually large size and freedom from weeds and pesticides, make good mulch. However, if you get them from a local tree feller, they contain quite a mixture of sizes. It is best to obtain them graded in size from a garden centre. They break down slowly, but use nitrogen from the soil as they do so. This problem can be overcome by sprinkling some organic nitrogen-containing fertilizer on the ground before spreading them. It can also be avoided by using it around native plants with low nutrient requirements. It is probably wise to ask your supplier for mulch that is from plantation grown timber not old growth forest. This is also a byproduct of the timber industry – pine or hardwoods – and is supplied in different sizes. It is best used on general garden beds. Like wood chips, it also draws nitrogen from the soil as it breaks down. Obtained from kerbside recycling this mulch contains a mixture of sizes and also, occasionally, bits of glass or other materials. But, a cheap option for general use. Straw is the stem material from grains and legumes remaining after the crop haa been harvested. It is a light mulch which breaks down relatively fast (in less than a year). Straw from legumes like lucerne and peas (pictured at the top of this article) are excellent because they are high in nitrogen, but they can be too expensive to use as a general mulch. They are best used on areas where the high nutrient content can be utilised best, such as the vegetable garden, and any remaining after the growth season can be dug in. A minor disadvantage is the presence of seeds which may grow – but at least they are easy to remove. Other types of straw are also available e.g. wheat, barley – they are cheaper but do not have high nitrogen. Sugar cane mulch is also “straw”. Unless you live close to the sugar cane area in the north of Australia, it will have a lot of embedded energy due to transportation. Unless you can find a certified organic source of straw, remember it will probably contain pesticide residues. Hay is cut and dried grass or legumes. Therefore, it contains more nutrients than straw so will enrich the soil. It is, however, likely to contain more seeds than straw and may also contain pesticides. Deciduous trees provide an annual source of cheap mulch. Leaves should be shredded, especially the larger ones, since they can form a mat when wet and not let water through. They can be useful in winter to provide an insulating layer, but break down fairly quickly. These break down fast and add nutrients to the soil. If fresh, grass clippings should be applied in thin layers because they can start to rot when wet. Alternatively, they can be applied more thickly if they are first dried. There is a risk, though that that seeds from the grass (or weeds in it) start to germinate. A thick layer of compost can be used as mulch. It breaks down faster than the above products, so would need to be replaced regularly. Compost is best used as a soil conditioner and many gardeners apply a layer of one of the above products on top of it. There are occasions when inorganic mulches are suitable because they don’t breakdown quickly and don’t need reapplication. However, they don’t add nutrients to the soil. They look attractive and help keep soil warm. But they may absorb too much heat and damage plants – they are more suitable for drought-resistant Australian natives plants or cacti. Scoria is a reddish volcanic rock full of holes that allows water to go right through. It is much lighter than pebbles and easier to handle. Take care though – over time, dust accumulates in the crevices of all rocks and gravel and creates opportunities for weed seed germination. This type of mulch is very difficult to remove should you decide to remodel the garden. Plastic sheeting or landscape fabrics, while suppressing weeds, don’t add nutrients to the soil. Moreover, they are manufactured so have required energy use in their production. Plastic sheeting has the added disadvantage of hindering passage of water and air to the soil – landscape fabric is more permeable. SGA does not recommend their use. 2. Moisten the soil thoroughly. Ensure that the water you apply is penetrating. 3. If water is running off the surface, fork through some compost to aid with the water retention. 4. If you are planting into the soil, add some compost into the planting hole. 5. Apply large particle-sized mulch thickly (6 – 8cm deep), keeping the area directly around plants clear. 6. If you are using bark- or wood-based mulches, you might consider sprinkling some blood and bone over the soil. This extra nitrogen will compensate for any nitrogen being taken up by the gradual decomposition of the mulch.